Montana Gov. Stephen Bullock ’94 delivered the keynote address at the fundraising gala, held at The Metropolitan Museum of Art. Stephen C. Bullock ’94, the charismatic governor of Montana who is being talked about as a possible Democratic presidential candidate in 2020, delivered a moving and rousing keynote address. He explained that Columbia Law’s Loan Repayment Assistance Program (LRAP) was crucial in affording him the flexibility to pursue a public interest career. “In 1991, I showed up at Columbia with a credit card and a pen to sign student loans, and little more,” he said. Bullock graduated with a job at a big New York firm, where he worked for two years until returning to Montana to be near his father who had terminal lung cancer. The equally lofty ambitions and inspiring accomplishments of the current generation of J.D. students were spotlighted in a short film shown during the dinner, which illustrated the campaign’s “We Were There” theme. In her remarks, Dean Lester cited the historic contributions of Columbia Law’s faculty and alumni in shaping the law and society since the school’s founding in 1858—from drafting rules of conduct during the Civil War, forging the New Deal, and defining the term “refugee,” to crafting the concept of “net neutrality,” striking down “separate but equal,” and arguing for marriage equality at the Supreme Court. 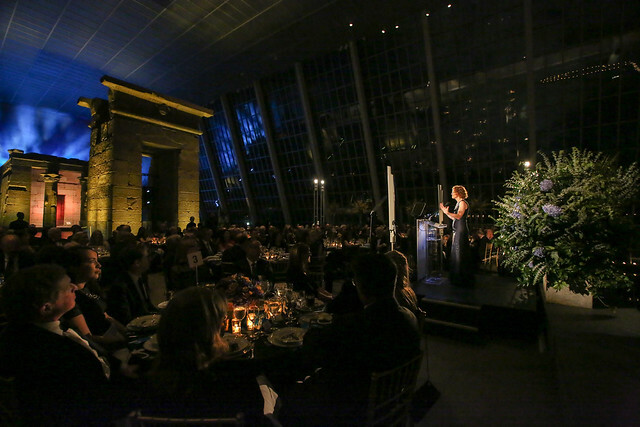 The gala, which began with cocktails in the museum’s Great Hall, was an elegant display of the Law School’s intellectual might and tradition of leadership. “At the Met tonight, we have a room full of Columbians, thinkers, and doers who are molding and mending our society year after year,” said Dean Lester. The other featured speakers were Michael I. Sovern ’55, the Chancellor Kent Professor of Law and president emeritus of Columbia University; Lee C. Bollinger ’71, president of Columbia University; Alison S. Ressler ’83, campaign co-chair; and Olatunde Johnson, the Jerome B. Sherman Professor of Law and vice dean for intellectual life. Professor John. C. Coffee Jr., chair of the Faculty Campaign Cabinet, was recognized by Sovern for securing donations from 100 percent of the Law School’s faculty. The Campaign for Columbia Law has already received pledges of $105 million, including a $15 million gift from the Jerome L. Greene Foundation. In addition to Ressler, the campaign is co-chaired by Brad Smith ’84 and Kathy Surace-Smith ’84 as well as honorary co-chair H.F. “Gerry” Lenfest ’58. During the next five years, the Campaign for Columbia Law aims to raise $100 million for scholarships and other student financial aid; $100 million for faculty and their research; $40 million to renovate the Arthur W. Diamond Law Library; $40 million for the Annual Fund; and $20 million to increase opportunities for experiential learning and expand the Law School’s 10 clinics.